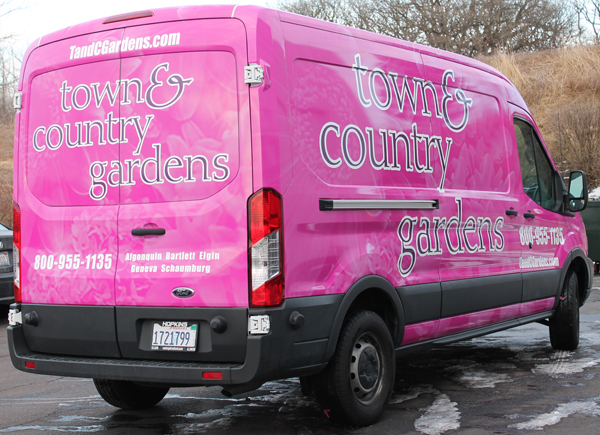 The next time you’re cruising in the Chicago area you might see some bright pink vehicles rolling around. If you do, you know flowers are on the way. Why? Because Town & Country Gardens has spruced up their vehicles with some super wraps that are sure to attract attention. Let’s find out more. For any company that has a vehicle fleet, a hidden opportunity awaits. These cars, vans and trucks all have surfaces that can carry your brand message all over town. The upfront investment is well worth it, as the vehicles end up serving two purposes: transport and advertisement. This florist company realized this opportunity and seized it. Just take a look. When you go about choosing the graphics for your fleet, resist the temptation to clutter the space. Instead go with bold lettering and the basic contact information, such as a web site address and phone number. You want to go with a focused message that will stick in people’s head. Remember to take advantage of every side of the vehicle. That way your brand gets attention in traffic from multiple angles. Who knows, given the increased frequency of aerial drones, we might even start to put logos on the vehicle roof tops! Make sure the graphics application uses material that will last and resist fading. You want your brand to shine for everyone to see, right? Also, the application process must be done in a controlled environment by experts. This avoids bubbles and dust getting under the wrap. So are you going to keep your plain dull vehicle fleet or are you going to spice things up a bit? Remember, the return on investment is worth it since vehicle wraps are seen thousands of times a year with a single initial investment. Superior Chicago vehicle wraps make your fleet work double time. Contact us or call at (630) 289-7082.